Did you buy a frozen turkey for Thanksgiving this year? If you did, let’s hope it’s already sitting in a big pan, defrosting in the refrigerator. 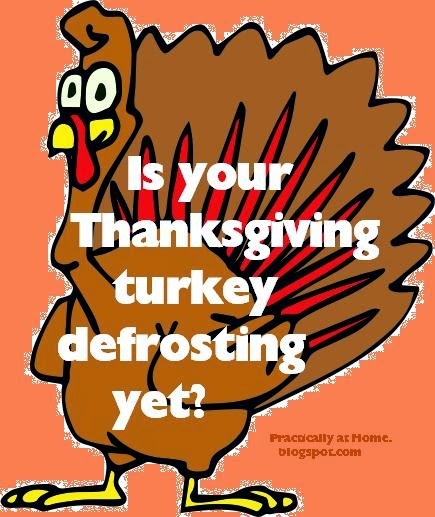 A 16-pound turkey takes approximately 3.5 days to defrost in the fridge. 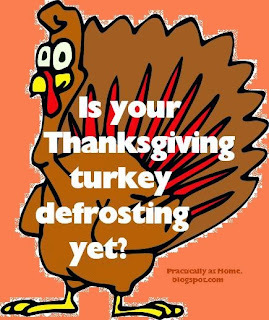 (That makes defrosting the turkey a Monday task during Thanksgiving week.) The formula calls for close to 5 hours per pound. If you bought a 20-pound turkey, you’ll likely have to use the cold-water thawing method, if you haven't started the process by Monday. Look here for instructions on defrosting your frozen turkey. Don’t be caught with a frozen bird on Thanksgiving Day. That would be a little half-baked. Well, not exactly. But you can see where I’m going with that. Ask any experienced Thanksgiving cook about the panic than may ensue, when the blessed bird is not nearly done at the appointed hour for the family feast. How many hungry Thanksgiving celebrants can peer through the oven window at one time, waiting for the stubborn little turkey timer to pop up, simply because the bird was half-frozen when it went in the oven? No one knows. But they’re willing to try, especially if your Thanksgiving bird isn’t fully defrosted in time for Turkey Day.